North Cascades: Frank & Team Summit First Objective: Sahale Mountain! 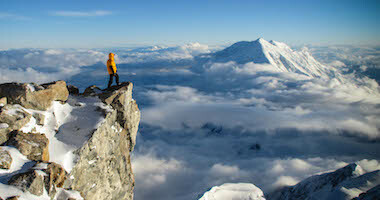 RMI Guide Eric Frank reported in from the summit of their first peak: Sahale Mountain. 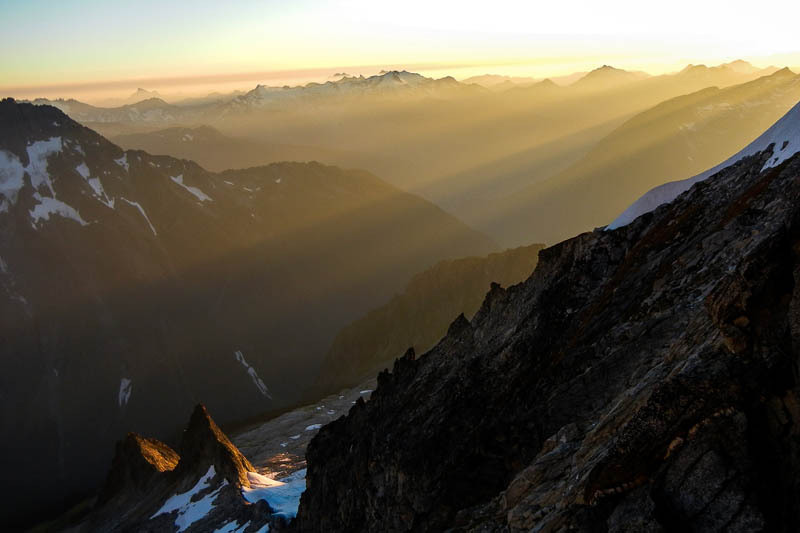 Sahale requires a strenuous glaciated climb up the Quien Sabe Glacier and a 300’ scramble up a 4th class rock pyramid. Eric reported that the wind changed direction last night and the wildfire smoke rolled back over them; which made for tough, smoky climbing. However, the team is happy with their first successful summit and ready for more. Hey everybody, this is Eric Frank calling from the summit of Forbidden Peak. It’s a few minutes after noon here, and we finally managed to get above the wildfire smoke. So we’ve just popped up above it and its nice cIean air here. We had a great climb this morning. We left from Camp around 5:30, and here we are on top two and a half hours later. We’re going to enjoy a few more moments, and then get packed up to head down. We will call to check in later today and let you know that we’re safely back in Camp. Thanks. 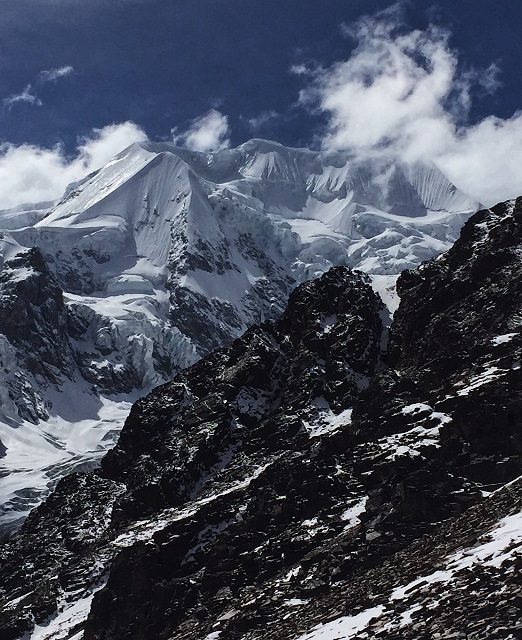 The Four Day Summit Climb August 5 - 8 led by RMI Guide Eric Frank reached the summit around 7:15 AM this morning. 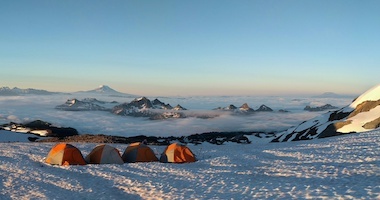 Eric reported warm conditions with a light wind above 13,000’ as the group ascended from Camp Muir to the summit of Mt. Rainier this morning. They enjoyed the views from the crater and began their descent from the crater rim around 8 AM. The team will return to Camp Muir and continue down to Paradise later this afternoon. Mt. Rainier: Summit Climb Teams Reach Summit! The Four Day Summit Climb Teams checked in at 7:40 AM as they were leaving the summit crater of Mt. Rainier. The group enjoyed blue skies and a really nice morning on the mountain. 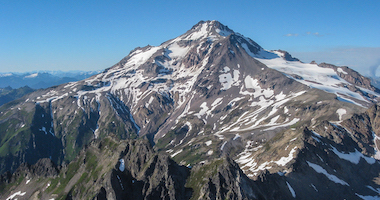 Once they return to Camp Muir they will repack and continue their descent to Paradise. They will end their program with a celebration at Rainier BaseCamp this afternoon. 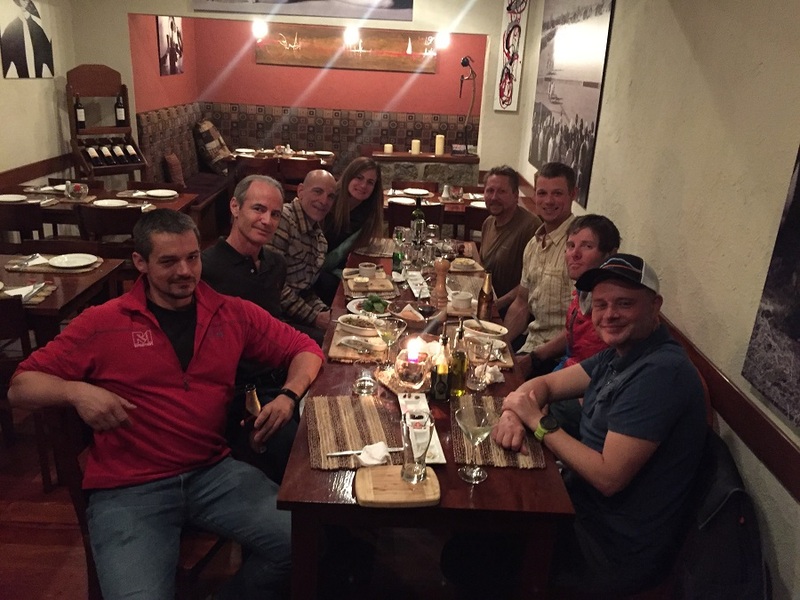 The Four Day Summit Climb teams led by RMI Guides Eric Frank and Christina Dale have reached the summit of Mt. Rainier. Eric reported chilly temperatures and light winds. The teams will enjoy some time on the summit before starting their descent. Chad you are so strong and amazing! I am so proud of you! I can’t wait to hear your stories!!! So proud of you Chad. Can’t wait to hear all about it and see some stellar Picts. Hopefully the skys were open? Mt. Rainier: RMI Teams Summit! 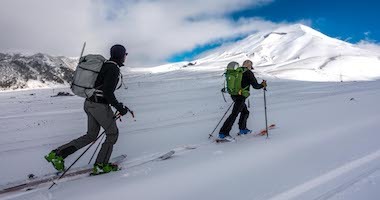 On a calm and cold morning, RMI Guides Eric Frank and Andy Bond led their teams to the summit of Mt. Rainier. They are above the clouds enjoying the sun on their descent. Congratulations to today’s summit climbers! Congratulations to all! Quite an accomplishment. This message is from the “other Stephanie Renner”. I’m so happy for Chris and Andy Renner! What an accomplishment! Hard rain overnight added to our adventure this morning as we loaded up in our land cruisers and navigated the Bolivian country side. At one point a bridge had washed out and we were forced to navigate a river bed. Much like scouting a rapid on a river, we were forced to send scouts with radios ahead to find our way. But don’t worry we’re all safely in La Paz enjoying the comforts of a shower, internet and even street side shoe cleaners to clean off our dirty shoes. We’ll enjoy one last group dinner tonight with the whole group. This trip would not have been possible without the help our amazing Bolivian staff. They’ve become like family to us and it’ll be our honor to treat them tonight for one final celebration! 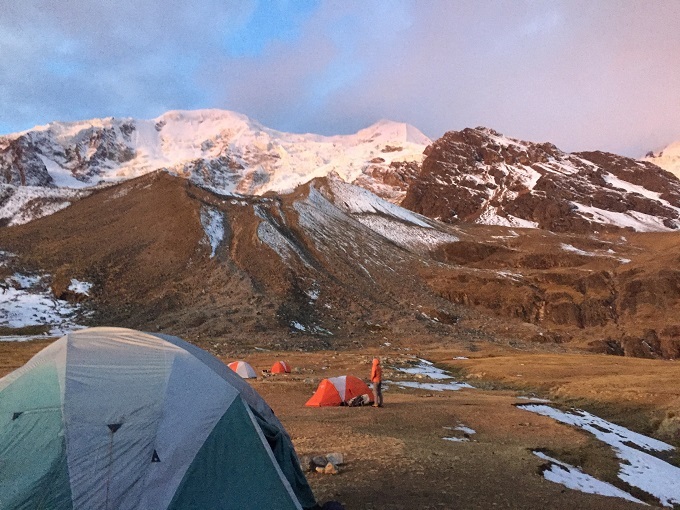 We awoke to a little bit of new snow at Illimani Base Camp, which further reinforced our decision to make our high point yesterday. We quickly packed our gear and headed out to our land cruisers in which an adventure ensued. 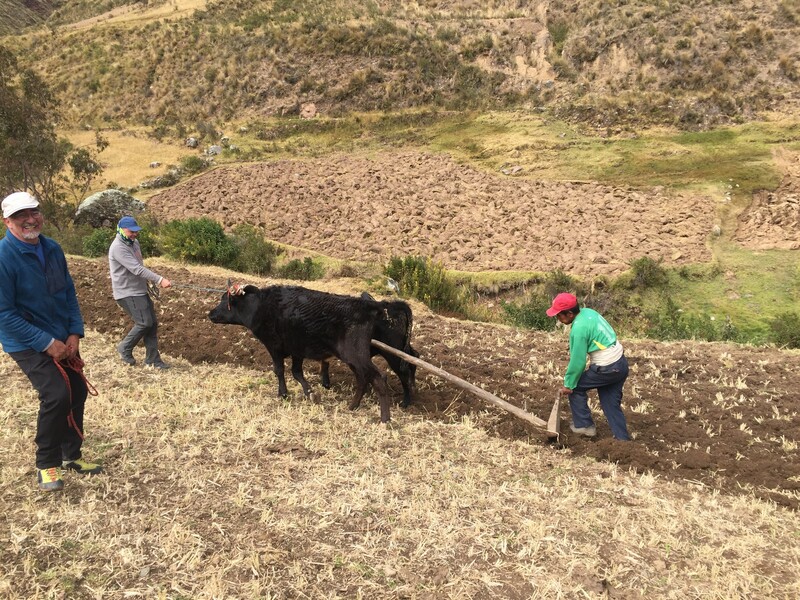 Driving around the high country side we enjoyed splendid views as well as picking up dinner from road side vegetable farmers. Ultimately we find ourselves camping at a low elevation of 8000’ on the side of river at a retired police officers house. Surrounded by tropical fruit trees we’re looking forward to having a fire, sipping on some beers and reminiscing about the last two weeks! Sounds like a perfect way to end the trip! Hope you all have safe travels home. Hello there. It’s Eric Frank calling in from Bolivia. It’s about 1:30 in the afternoon (BOT Time) and I’m at 17,400ft here on Illimani. Unfortunately, we decided this will be our high point for the climb. It’s a combination of recent storm snow, and the forecast, which has made us decide to head down hill. So at this point we’re going to move back to our base camp and spend our last night in the mountains. 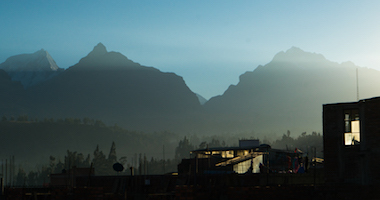 Tomorrow we will pack up, head back to La Paz, and in two short days, be back at the airport. We look forward to seeing all of you soon. Bye. We are very proud of you guys especially our guy Chris! Amazing accomplishments this trip. We can’t wait to see your face. Like all good mountaineers, it’s okay to be lazy. 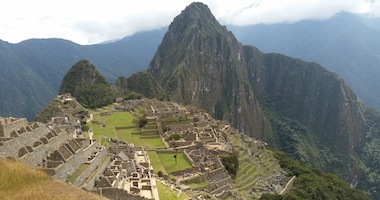 Two summits in three days, our group enjoyed a much deserved rest day in La Paz. 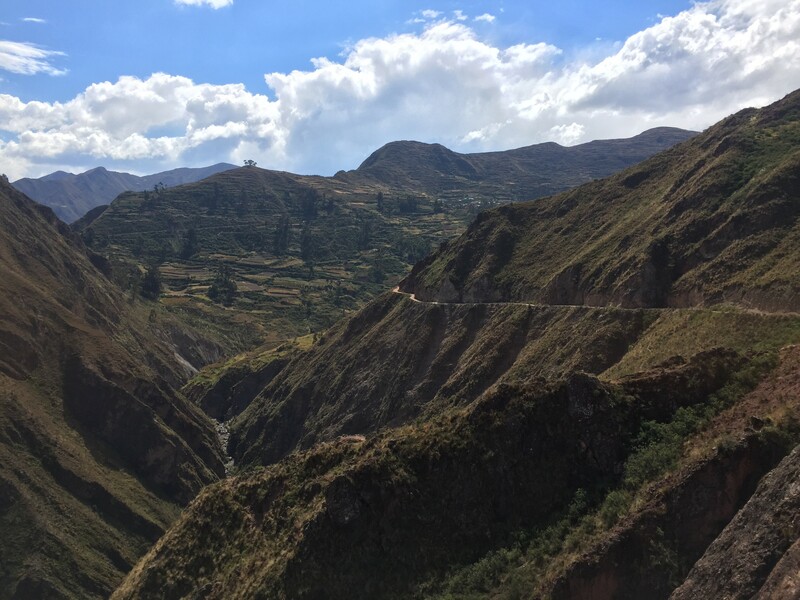 We shopped, we ate and we slept as we get ready for our third and final peak Illimani. The rest day also came at great time, as it was a rainy day in La Paz bringing a fresh coat of snow to the mountains. We’ll enjoy a nice dinner tonight before heading back into the mountains tomorrow!